This is a story of the people who helped shape today’s safety industry and paved the way for future changes in the management and perception of health and safety. 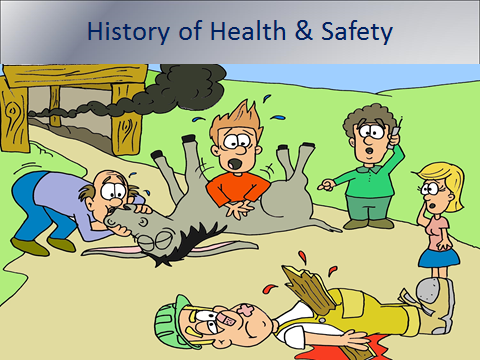 This is a story of the evolution of health and safety according to a safety professional we’ll call Band-aid Bob. This is also a story of The Evolution of Safety Human Factors – According to Band-aid Bob. In the late 1800’s, there were no health and safety professionals. Companies would never have thought of retaining people specifically to manage health and safety for them. In fact, in the workplace, humans really were not ranked all that high as a resource. In the mining industry for example, mules were often used to haul equipment and materials in and out of the mines. When a serious incident occurred such as an explosion, rescue operations focused not on humans but on the mules. A dead mule cost the mine around $24 to replace. A worker, making around $3 per day, was inexpensive to replace as there was generally a lineup of people willing to work in exchange for pay. If a worker was only injured he would be sent home to recover with no pay. If he recovered fully, he would be allowed to return to work. In the early 1900’s (i.e. around 1914), workers’ compensation insurance was established in many areas in North America. The insurance provided compensation to employees who were injured as well as to the families of those who had died on the job. It was at this time that companies started hiring people to help patch up their injured workers and to get them back to work as soon as possible, as well as help prevent further injuries. Some called these people “safety advisers”. The evolution of the Safety Adviser’s role is perhaps best shown by the legend of an individual known as Band-aid Bob. Band-aid Bob wasn’t his real name, but that is what he came to be called. If ever there was a safety person who could patch people up after they were injured, it was Bob. At this time in the evolutionary history of health and safety, there was no such thing as formal health and safety management systems. Workplace injuries were common and accepted as part of the job. People like Band-aid Bob were typically hired by only the largest of companies who needed someone to administer good first aid and felt they could afford the overhead. Many of these safety people were workers with work injury disabilities such as a missing hand, fingers, or toes. After all, if anyone knew anything about health and safety, it had to be an already injured worker. Bob was very good at his job. One evening, tired from a hard day of administering band-aids, cauterizing wounds, and massaging strained muscles, Band-aid Bob decided to take some time for himself. He packed up some gear and hiked into the mountains. Trekking up Mount Doringba, he made an incredible discovery that would change how companies viewed employee health and safety. High on the mountain, Bob stumbled onto some tablets inscribed with strange writings. Among many broken pieces of tablets, he found two intact pieces. Excited about his find, he brought the two tablets back to the City and had them transcribed. The tablets’ writings proved to be pivotal to health and safety as they identified key elements to achieving health and safety excellence. The elements included: Management Commitment and Involvement, Hazard Identification and Assessment, Records and Administration, Inspection, and Investigation. To many people, Bob’s new approach to safety made a lot of sense and, over time, Bob gained quite a following. Soon word spread and companies all over the world adopted the elements. Mounting interest in the elements gave rise to numerous health & safety associations, safety professionals and consultants who all helped spread the word to millions of companies and their employees. Many companies hired people dedicated to implementing and maintaining these landmark elements. Billions of dollars were spent implementing them. For a time, improvements to health and safety were achieved. Companies employing the elements noticed reductions in incident and accident rates. Fatality rates decreased. Insurance rates decreased. This success lasted for many years but, there came a time when fatality rates stopped decreasing and some people started to question the value of the basic program elements. Others suggested the basic elements had improved about all they could improve in their companies. They called for a re-evaluation of the status quo, but the prospect of change was a very hard sell. By this time, so many people had bought in to the basic health and safety elements that had been passed down to them by Band-aid Bob. Their livelihood depended upon them. To now buy into alternative approaches threatened their very existence and would suggest they had all along been following the wrong path. And so it went on for many years: companies entrenched in Bob’s basic elements failed to achieve the safety excellence promised them. Many health and safety professionals reported difficulties in getting the elements in place and functioning fully. At this time in the evolutionary era of health and safety systems, many viewed health and safety as a program, separate from all other aspects of the business. As with other “programs”, when times got tough, health and safety systems got cut or downsized to make way for leaner programs yielding profit. For many of these companies, survival and productivity were the real number one priorities. Health and safety was silently considered to be an extra cost of doing business. It was around this time that some important truths were revealed that would result in another enormous shift in health and safety management philosophy. Dissatisfaction continued to increase with the current approach to health and safety. Band-aid Bob Jr., grandson of Band-aid Bob (who had passed onto that safe haven in the sky) and also a Safety Adviser, reflected on the state of health and safety at this time. More than 90 years had passed since Band-aid Bob had discovered the basic safety program elements. This approach had failed to yield the improvements to employee health and safety that had been promised. If ever there was a time to re-think the old failed philosophies around health and safety program management, this was it. So, Band-aid Bob Jr. packed up his things and retreated to the mountains, coincidentally to the exact mountain and spot where his grandfather had retreated many years ago. When Band-aid Bob Jr. arrived at the spot where his grandfather had made his discovery, the area, at first, seemed clear. But then he stumbled on a half-buried rock and, upon closer examination, he noticed that it was more than just a plain old rock. Also, he noticed other rocks poking out of the earth. He spent some time digging them out, packed them up, and returned to his home in the City. Without hesitation, Bob went to work on cleaning up the rocks and putting the pieces together like a jigsaw puzzle. When he was done, he found that he had two more complete tablets containing more direction on how to achieve safety excellence. This was the Evolution of Safety Human Factors. He had them transcribed into English. When he showed off his new find, there was a great commotion, but mostly there was disbelief. “How could there be more elements?” people exclaimed. There were many meetings and discussions about the new elements and they were examined one by one. Following is a summary of what some call “Health and Safety Human Factors,” along with some of the meeting discussions. A company’s real health and safety priorities are revealed not by cleverly crafted policies posted throughout the facilities, but by how the employees carry out their work. It only takes one incident of management telling a crew to drive to the worksite in a blinding storm, to carry out work short-staffed, to work hastily, or to skip the pre-job safety meeting, to undermine thousands of verbal and written affirmations of “safety first”. Workers’ behaviour are strongly influenced by their perceptions of the company’s real health and safety priorities. If they believe safety takes a back seat to production, employees will make the decision to take that trip in bad weather or work short-handed. When an incident occurs, it is easy to blame the employee for not complying with the documented procedures. Unfortunately, the company’s real values and priorities are rarely identified as even contributing incident factors. A bond of trust may be formed between workers and management when the acts of management convince workers that they can confide in their supervisors and can count on them to act or respond in a predictable way. For example, managers are trusted when they promptly follow up on safety meeting issues. In such an environment of trust, employees will freely bring up safety issues at safety meetings because they know they will be acted upon. Alternatively, lack of action leads to lack of trust and many very quiet meetings. Trust is also diminished when it is violated, such as when an agreement between supervisor and worker is broken. Once this trust is broken, it requires many positive acts by management to regain it. Employees must feel that they have a “stake” in the program. Employees are more accepting of a program they helped develop than they are of one that has simply been handed down to them. For example, it is difficult to imagine anything more boring or wasteful than a group of workers sitting around a table in a safety meeting, listening to their supervisor read out safe work procedures developed by either them or the Safety Advisor. Half of the employees present will likely have their mind elsewhere. What really gets employees’ attention is having them participate in safety procedure exercises or emergency drills, then soliciting their input. Employee participation brings about improved procedures that employees are more committed to following because they have participated in their development. Autonomy takes employee participation to another level as employees are allowed to actually make key decisions on various aspects of the program. The levels of commitment obtained through participation and autonomy are far greater than what would be obtained by a supervisor reading aloud at a meeting. Companies that allow for a high degree of employee autonomy generally have what is typically called an “open culture” because they engage employees in decisions and in the creative processes. Credibility is closely aligned with trust. Trust is gained when there are no differences between what is said and what is practised. For example, when management condones or ignores the behaviour of workers who are not complying with procedures, credibility is lost. The next time management promotes compliance to procedures, employees will roll their eyes in disbelief. Alternatively, if management is aggressive in correcting the behaviour of some individuals but not others, their credibility again comes into question. As with any of these human factors, there are no barriers to protect management from these negative employee perceptions leaching into other aspects of the business. If one has lost credibility in safety, credibility overall is lost. A manager’s ability to manage all other aspects of the job effectively is negatively affected. Leadership is a key element of the human factor-oriented approach to health and safety. It is leadership’s words and actions that establish behavioural expectations of employees. One can generally determine the extent of management’s leadership in health and safety by observing how workers behave on the job. If employees demonstrate a lack of commitment to health and safety it is because management has not led the health and safety charge. In order to influence employees, leaders must demonstrate unwavering support for health and safety regardless of the business climate of the day. Leaders must always “walk the talk”. They can never make exceptions and allow operations to take priority over employee safety. For example, if a manager, despite operational costs, shuts a job down to ensure worker safety, he or she is a leader who will be believed when he/she proclaims that safety is number one. When exceptions are made to allow production to continue at the expense of safety, the leadership sends a strong message that production is really the number one priority. Under these circumstances, any attempts to convince employees that safety is management’s number one priority are simply not believable. When companies demonstrate to employees they truly care, they benefit from the hard work performed by satisfied employees. They are also rewarded with employees who are more committed to the company. This generally translates into improved safety, productivity, quality, and/or service. Here is one small but powerful example of caring. Some companies send flowers to employees and their family members who are seriously ill in the hospital. This act represents very little in terms of investment in time or money, and goes a long way towards increasing employees’ sense of security, compliance, satisfaction, and loyalty to the company. Newly hired employees come to employers with their own preconceived health and safety attitudes and expectations. If their attitudes are closely aligned with the company’s and their peers’, their attitudes will be reinforced. If this is not the case, the new employee will have difficulties fitting in. For example, an employee who does not accept the need to follow all safety rules, procedures, etc. will not likely follow them when the boss is away. If he or she hasn’t in the past, why start now? One way to avoid these types of issues is to improve the hiring/screening process. Hire employees whose values and attitudes are aligned with those of the organization. Put simply, make sure they are a proper fit for the company. Many companies focus their new employee orientation efforts on the content of the new employee orientation program. As important as the content is, the orientation process is equally important. Most employees get their real orientation when they begin working with their peers. Peers inform new employees on “how things are really done around here.” If the new employee is orientated by a peer or peer group that feels a few safety exceptions are okay, the new employee will be orientated with the wrong messages. New employee orientations should be conducted by experienced employees who are aligned with the company health and safety values and principles. Identify and dispense with folklore or legends of renowned past employees or heroes that do not reinforce the behaviours that are currently desired. For example, Angus MacTavish was a gas utility employee. Legend has it he once performed a rescue by jumping into to a bell hole full of leaking gas. First he minimized the gas flow by bending over the steel gas line, and then he hoisted an unconscious worker over his shoulder and climbed out of the six-foot-deep bell hole to safety. With another deep breath, Angus apparently went down and saved a second employee. This legend suggests Angus was superhuman. The reality is that there are very few people strong enough to actually do what Angus is rumored to have done—especially under conditions of little oxygen and blowing gas. If this company now has procedures in place to ensure this type of rescue is never attempted, legends such as this will work against compliance with the new procedure. In order to attain full compliance, conflicting legends must be dispelled, otherwise they may be modelled. One way to dispel the legend in the above case is to conduct mock exercises to practise removing unconscious employees from a bell hole. No employee will be able to perform Angus’s rescue and that will help reinforce the new more time consuming but safe rescue procedure. Employees must believe the environment they are working in is fair and free from bias or injustice. Few employees complain about a system in which the standards and consequences of compliance are laid out clearly and are consistently enforced. If discipline is warranted it must be perceived to be fairly administered. On the other hand, workers become frustrated when they have been held accountable for something others have been allowed to get away with. One of the worst exceptions in this regard is when workers are disciplined for non-compliance but exceptions are made for supervisors or managers. Companies should always strive to create a just and fair culture. It is a well-known fact that satisfied employees are more productive, take fewer days off for illness, stay with the company longer and have fewer incident/accidents. The deeply hidden benefits of implementing an effective health and safety program are that it opens the door to good two-way communication and fosters employee participation and trust. In this environment, employee satisfaction improves. Satisfied employees benefit companies not only by improving health and safety in the company, but also by improving all other aspects of the business. Companies that view health and safety from this perspective understand that health and safety adds value to an organization. There are many factors affecting why individuals behave the way that they do. The factors influencing employee behaviour are varied and complex. Supervisors and managers cannot be counted on to understand them all. However, some of the factors that affect behaviour are well known and understood and therefore are useful tools for management and supervisors. For example, behavioural science tells us that if supervisors and management provide positive recognition for any desirable behaviour, the behaviour is more likely to be repeated. If an undesirable behaviour is condoned or overlooked because the supervisor or manager chooses not to address it, the undesirable behavior will be reinforced and repeated. All supervisors and managers should be aware of these are simple behavioural truths. Safety excellent companies are well aware of the influences that a positive health and safety culture can have on employee behaviour. Many of them conduct safety perception surveys to access employee perceptions so that they can work on improving negative employee perceptions. We have come a long way since the early stages of health and safety. Each new era has brought new improvements to health and safety management systems. The new elements discovered by Band-aid Bob Jr. (and real-life health and safety professionals) are proclaiming a new and exciting era in health and safety. It’s an era where “health and safety” is no longer viewed as just another program, but as a key contributor to success in business. The move towards these more human-oriented elements promises to help bring about improvements to corporate health and safety culture that will have positive effects on all other aspects of a business. Some companies have already discovered these cascading benefits and have evolved into health and safety leaders and, not surprisingly, leaders in their respective businesses. The Evolution of Safety Human Factors – According to Band-aid Bob does not end in this era introduced by Band-aid Bob Jr. There may be more important elements introduced in the future and, but for now, we should work towards understanding Band-aid Bob Jr.’s human-factored safety elements, determining how they can help us, and learning how to measure them so that we can continue to improve our health and safety management systems. The new elements promise to open the door to a host of improvements for companies—not only to employee safety but quality, productivity, and service. Perhaps one day, health and safety programs will no longer have to be mandated. A new approach to health and safety systems will entice companies to implement them because of the value they can bring to an organization. Surely, Band-aid Bob Sr. and Jr. would both approve. Compass Health & Safety Ltd.